Look who gets to free range! Yup, I was going to do this anyway once the snow began to leave… Highly Supervised… but now, since Elsa-the-pheasant-killer is happily running through Dog Heaven, I’m doing this in Less Supervised Mode. Lucas-the-original-chicken-killer, watches, and is 90% unfazed by them. They don’t seem to excite him, although he had quite the wary eye as they pecked and scratched within a few feet! Not that I would lock him in the chicken coop or anything, but he passes the Less Supervised Test as well. And, my! the girls are happy! They have returned to the coop to lay their eggs, and have wandered through the mud and crud in splendor. Last night they were “trapped” on the backside of a 6″ high snowdrift, trying to make it back to the coop. They didn’t want to walk through it. They didn’t want to fly over it. 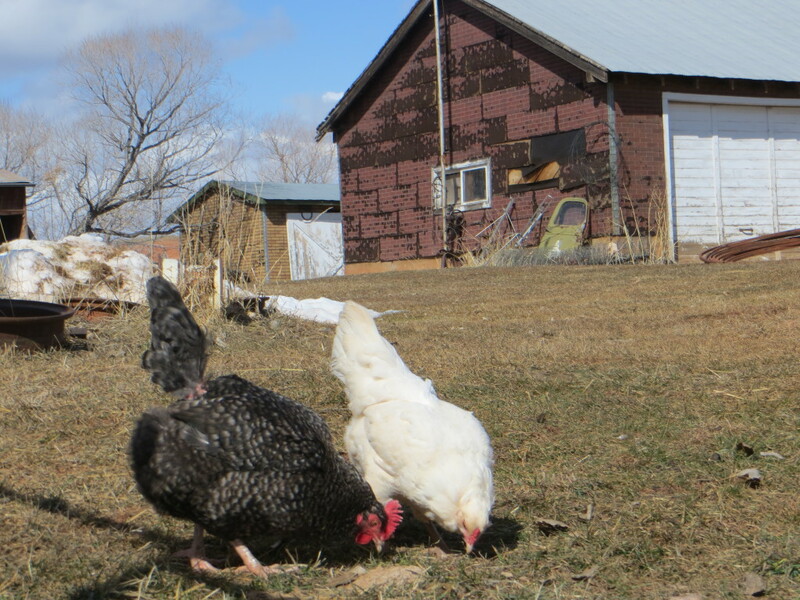 They didn’t want to go backwards which would have let them walk through the mud, but was AWAY from the coop. I finally had to goose them, which worked for two of them, sending them into flight with favorable landings… but the one who flew to the middle of the drift, landed to her belly in snow, and had such a look of bewilderment about her… was the one that made me laugh! Oh chickens! Gotta love them! How great they can be our and about doing what they love… glad the doggies are content with them… the chickens are so pretty…. Nice to see some dirt again isn’t it?